Tinkering Education Conference in Beijing — Wonderful Idea Co. This past week I was in Beijing for the International Tinkering in Education Conference hosted by Star Group at the Soon Ching Ling Science and Culture Center. 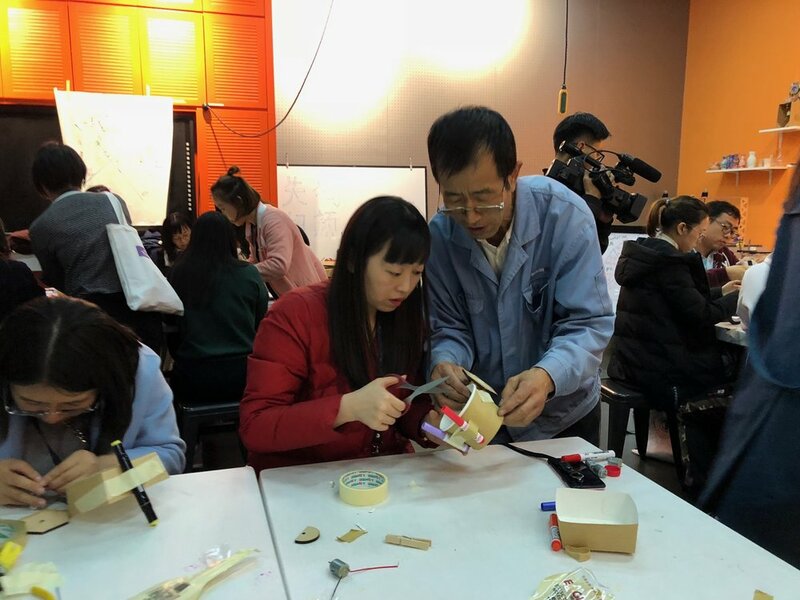 It was a great chance to connect with tinkerers and educators in China and share some of our latest ideas for workshops and activities. I arrived a couple days early to the Tinkering Shop at the center to gather materials and work with the team. It was super fun to see the ideas they were working on including a laser cut roller coaster using DAGU motors and an automata like contraption with an offset cam to make a motorized dance. We planned to set up a series of kitchen tinkering experiments inspired by our ASPAC workshop to share with the attendees before the dinner at the end of the conference day. For one of the stations I converted the bubble blowing tupperware machines into chopstick robots by switching the orientation of the servos. Additionally I prepped seven activities for the Tinkering Kitchen along with all of the materials for an art machines workshop with conference goers. The team from Tinkering Shop helped by gluing googley eyes onto realistic plastic fruits and veggies. The next day we started the conference with a series of talks by local and international speakers. Olle Bjerkås shared about his giant serpinski tetrahedron, presenters from Lawrence Hall of Science, Technopolis and Science North talked about their tinkering programs and environments and the team of translators from the Tinkering Studio’s Art of Tinkering book shared a behind the scenes look at their process. As well, the team from HKD, Geek and Genetic Moo shared experiments with making games that encourage collaboration, playfulness and engagement with science topics. I shared our current work with activity development, professional development workshops and pop-up tinkering environments. In the afternoon I led a ninety minute hands-on workshop with about thirty participants to build art machines. We started with the compass points activity sharing our ideas about tinkering after the morning of presentations. We spent the rest of the time experimenting with building art machines using batteries, motors and a variety of cups and baskets. There were so many amazing innovative creations from the conference participants and it was great for everyone to get the chance to experience tinkering as a learner. In the evening we had a pre-dinner making appetizer with the seven different tinkering kitchen experiments. The entire conference started the event by having a spaghetti and marshmallow tower building challenge in groups of three. Then we spread out around the room to try stations including fork/knife switches, light play with kitchen tools, stop motion with fake food, food-themed automata and chain reaction as well as the chopsticks bots. Part of the tinkering tenets are to use familiar materials in unfamiliar ways and I think that this prototype accomplised that as well as providing a possible entry point to science and technology experiments. 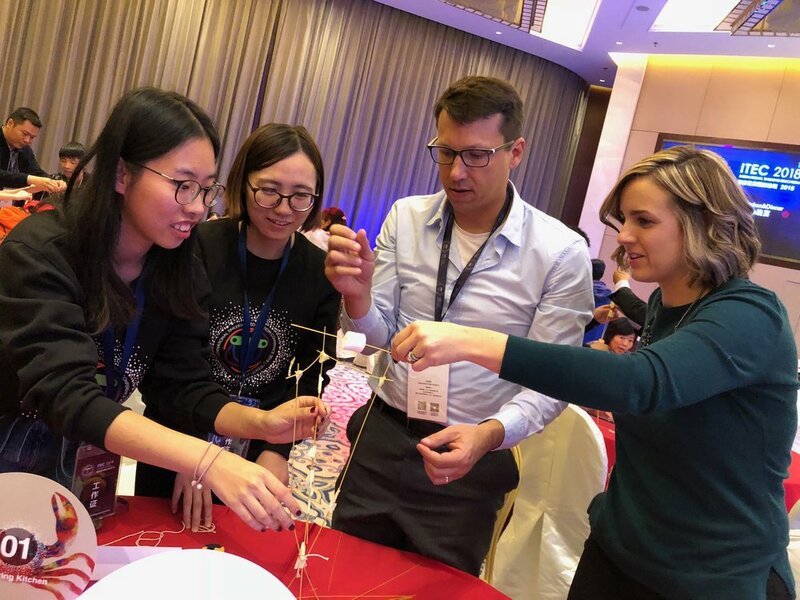 The conference was a great chance to connect with tinkering educators in a different part of the world, share ideas and learn more about the context for tinkering in china. I’m already looking forward to collaborating again with this Tinkering Shop and Star Group team.